This MacWorld 1984-2004 poster commemorates the original commercial from 1984. It measures 24" x 36" and reads, "1984 - 2004". 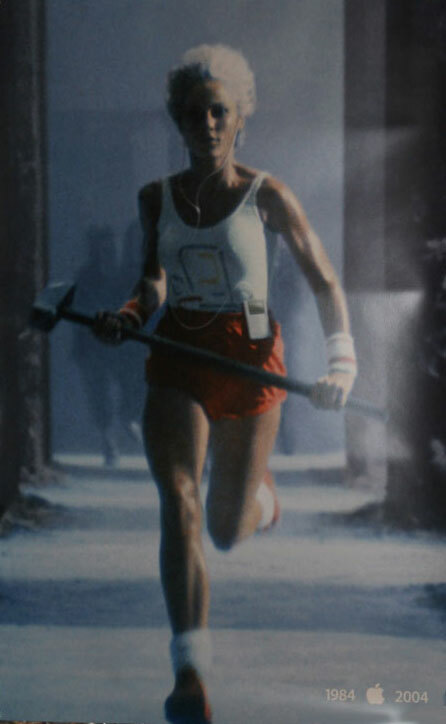 The poster has the image of Anya Major, the woman runner in the Picasso-style top from the famous Super Bowl 1984 television commercial, only this time she is wearing an iPod. This is the poster from Apple's 1984 Superbowl Commercial, modified for 2004 with the lady hammer thrower now wearing an iPod. That commercial only aired once in 1984 and this updated poster was available only at the Apple booth during MacWorld San Francisco 2004. Apple has not released any posters since 2004.